The spirit of Standing Rock – the indigenous led movement to protect land, water, and culture from the fossil fuel industry – is spreading across the country and inspiring communities to act. 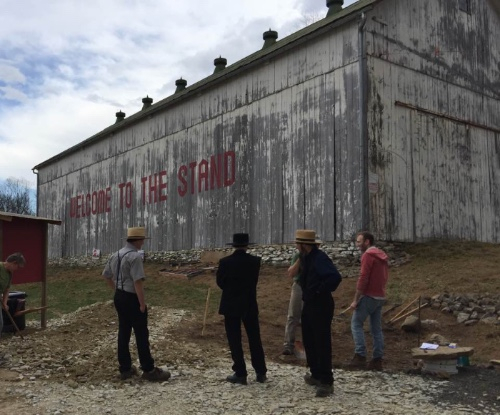 In Pennsylvania, Lancaster Against Pipelines has set up a Standing Rock style encampment called The Stand, where they are preparing for nonviolent mass action to stop the construction of a pipeline from tearing through their beloved farmland, woods and backyards to transport fracked gas for export. The pipeline company, Williams Partners of Tulsa, Oklahoma is benefiting from an abuse of eminent domain in which private land in the path of their pipeline is being condemned, not to benefit the public as eminent domain was intended, but rather to bring greater profits to an out of state corporation. Lancaster Against Pipelines cofounder Malinda Clutterbuck exclaims, "The hardest thing to accept is that large corporations are given permission to devastate our lives and threaten our health and safety for private profits, while we who live here have no say in the process. Eminent domain for private gain is wrong." This outrageous abuse is happening all over the country. Rather than defend their own constituents who are crying out for help to protect their communities and environment, many politicians at all levels of government are siding with the fossil fuel executives who fund their campaigns. Thanks to the Supreme Court decision Citizens United, corporations are free to pour unlimited money into political campaigns, which has created collusion between corporations and government that is threatening our democracy, as well as our safety and well-being now and for the generations to come. With the lack of enforcement and the removal of regulations that protect the public, corporations are free to increase their profits, while citizens suffer greater poisoning of our air, water and soil. The Lakota Sioux at Standing Rock tell of a 1000 year old Lakota prophecy that describes a Black Snake that would one day rise from the deep and move across the land bringing destruction and great sorrow. The Sioux believe that the Black Snake has arrived in the form pipelines and the most powerful economic and political force in the world - the fossil fuel industry. As the prophecy further warns, if the Earth’s people do not unite to defeat the Black Snake, the world will end. As we near catastrophic climate change, this could be our last chance, individually and as a nation, to choose life over money, love over fear and join as one people to defeat the Black Snake. Please join us in carpools from Philadelphia to The Stand at 325 Conestoga Blvd, Conestoga, PA, or meet us there a noon for an orientation by leaders of Lancaster Against Pipelines. We are leaving Philadelphia at 10am, and plan to arrive back home by 4 or 5pm. We are bringing brown bag lunches and also bringing food supplies to contribute to the kitchen at The Stand. If you plan to attend and would like to join a carpool, please contact me at judy@judywicks.com. Lancaster is the primary breadbasket for Philadelphians who eat local food. It's in our own interest to support the farmers and protect the land, water and rural communities. And it's our duty to defeat the black snake where ever it appears. If you cannot come on the 25th, please consider donating, volunteering and/or signing the pledge at www.wearelancastercounty.org.